"I love this movie! It offers a crash course in the hidden history of the Internet – and shows how this revolutionary platform capable of enhancing freedom and democracy is being subverted into a vehicle for monopoly, hyper-commercialism, and surveillance." , based on the acclaimed book by media scholar Robert McChesney, trains its sights on the relationship between the internet and democracy in the age of fake news, filter bubbles, and Facebook security breaches. In a wide-ranging analysis that moves from the development of the internet as a publicly funded project in the late 1960s to its full-scale commercialization today, McChesney traces how the democratizing potential of the web is being radically compromised by the logic of capitalism and the unaccountable power of a handful of telecom and tech monopolies. The result is an indispensable classroom resource — a vital tool for helping students make sense of a technological revolution that’s radically transforming virtually aspect of human communication. While most debates about the internet continue to focus on issues like the personal impact of internet addiction or the questionable data-mining practices of individual companies like Facebook, Digital Disconnect raises bigger questions about the political impact of the corporate and commercial interests that now dominate the internet. Along the way, it examines the ongoing attack on net neutrality by telecom monopolies like Comcast and Verizon; explores how internet giants like Facebook and Google have amassed huge profits by surreptitiously collecting personal data and selling it to advertisers; and shows how these companies have routinely colluded with the national security state to advance covert mass surveillance programs. Even more urgently, Digital Disconnect clarifies how the rise of social media as a leading information source has worked to isolate people into ideological filter bubbles and elevate fake news at the expense of real journalism. At a time when debates about the questionable business practices of telecom and tech companies are moving to center stage like never before, Digital Disconnect raises crucial questions about who gets to control the internet and what it means for our democracy. 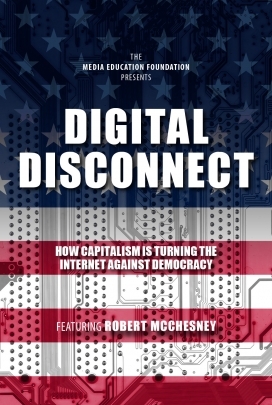 "Digital Disconnect combines McChesney's terrific explanatory skills with MEF’s wonderful production values and creativity, providing a one-stop ‘zero-to-60’ education in the most important topic of our times." is the Gutgsell Endowed Professor in the Department of Communication at the University of Illinois at Urbana-Champaign. His work concentrates on the history and political economy of communication, emphasizing the role media play in democratic and capitalist societies. 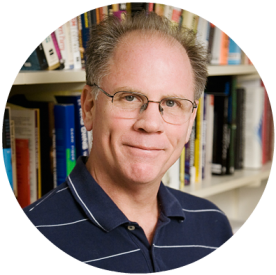 In 2002 McChesney was the co-founder of Free Press, a national media reform organization. He also hosted the “Media Matters” weekly radio program on NPR-affiliate WILL-AM between 2002 and 2012. From 1988 to 1998 he was on the Journalism and Mass Communication faculty at the University of Wisconsin-Madison, where he was selected as one of the top 100 classroom teachers. McChesney has written or edited twenty-seven books, including, most recently, People Get Ready: The Fight Against a Jobless Economy and a Citizenless Democracy (co-authored with John Nichols); Dollarocracy: How the Money and Media Election Complex Is Destroying America (with John Nichols); and Digital Disconnect: How Capitalism Is Turning the Internet Away from Democracy. In 2000, McChesney authored the multiple award-winning Rich Media, Poor Democracy: Communication Politics in Dubious Times, which was reissued by The New Press in 2015 with a new preface by the author. His work has been translated into 34 languages. Mailed directly to you within 5-10 business days. Want streaming access to films in the Media Education Foundation collection, the most sought-after video collection on media & culture? Week-long streaming rentals available for $50. WAYS TO WATCH DIGITAL DISCONNECT NOW. Over 650 universities and colleges already have streaming access to Media Education Foundation films via the Kanopy streaming platform. Do you think your school is one of them? Check to see! If you already have access, you'll be able to access and watch our films! Stay connected. We love hearing from you.